If you have bundle branch block, it means that your electrocardiogram (ECG) is displaying an abnormal and distinctive pattern, indicating that the electrical impulse of your heart is not being distributed normally through your cardiac ventricles. In some cases the presence of bundle branch block is a sign of serious underlying heart disease, and occasionally the bundle branch block itself causes problems. But in many other cases, bundle branch block is essentially a nonsignificant finding. To distinguish these two possibilities, doctors should do at least a baseline cardiac evaluation in anyone who is found to have bundle branch block. In this article we will talk about what a bundle branch block means, and what questions you might want to ask your physician if you have this condition. To understand bundle branch block and why it may be significant, it is useful to know something about the heart’s normal electrical system. The bundle branches are an important part of the cardiac electrical system, the system that regulates heart rhythm and coordinates the pumping action of the heart. The heart beats in response to the heart’s own electrical signal. As the electrical signal is distributed throughout the heart, the heart muscle contracts. So the organized, well-timed distribution of the electrical impulse is very important to the efficient functioning of the heart. The heart’s electrical signal originates in the sinus node in the upper right atrium, spreads across both atria (causing the atria to beat), and then passes through the AV node. Leaving the AV node, the electrical impulse penetrates the ventricles via a band of cardiac fibers called the His bundle. From the His bundle, the electrical impulse enters the two bundle branches: the right bundle branch and the left bundle branch. The right and left bundle branches distribute the electrical impulse across the right and left ventricles, respectively, causing them to beat. When the bundle branches are functioning normally, the right and left ventricles contract nearly simultaneously. An ECG is a visual representation of the electrical impulse as it moves through the heart. The QRS complex is the portion of the ECG that shows the electrical impulse as it is being distributed by the bundle branch system throughout the ventricles. In the figure above, Panel A shows what a normal QRS complex looks like on a normal ECG. (For those who are interested, this figure shows lead I from a 12-lead ECG.) Since both ventricles normally receive the electrical impulse at the same time, the normal QRS complex is relatively narrow (generally less than 0.1 second in duration.) The simultaneous stimulation of both ventricles depends on the electrical impulse traveling down both the right and left bundle branches at nearly the same rate of speed. The job of the bundle branches is to distribute the cardiac electrical impulse across the ventricles evenly, so that when the ventricles contract (to eject blood out of the heart), they do so in a coordinated and efficient fashion. The right bundle branch delivers the electrical impulse to the right ventricle, and the left bundle branch delivers the impulse to the left ventricle. In bundle branch block, one or both of the two bundle branches are no longer transmitting the electrical impulses normally. This often occurs as a result of disease or damage to one of the bundle branches, as may happen with a myocardial infarction (heart attack) or with cardiomyopathy. However, bundle branch block can also happen for no apparent reason, in completely healthy people. When the electrical impulse is delayed in reaching its respective ventricle, the delay shows up as a distinctive pattern on the ECG called a bundle branch block. The chief effect of a bundle branch block is that it disrupts the simultaneous contraction of the two ventricles. The contraction of one ventricle (the one that has a "blocked" bundle branch) occurs slightly after the contraction of the other, rather than at the same time. Note that while the term bundle branch “block” is used, the affected bundle branch may or may not actually be “blocked.” In many cases, the bundle branch is not completely blocked, but instead is simply conducting the electrical impulse more slowly than the opposite bundle branch. People who have bundle branch block usually have either right bundle branch block (RBBB) or left bundle branch block (LBBB), depending on which of the two bundle branches is affected. 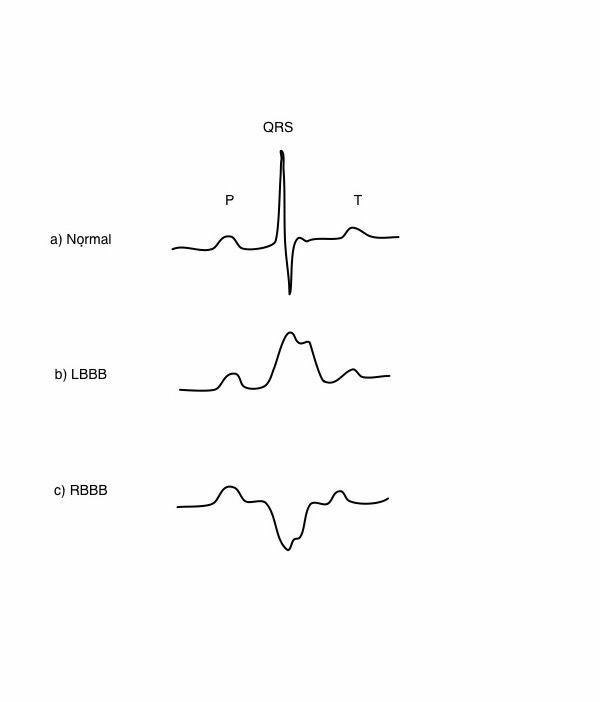 Panels B and C in the figure illustrate the characteristic changes that occur in the QRS complex when a person has left or right bundle branch block. In both cases, the QRS complex is no longer narrow; it becomes much wider than normal. The widening happens because it takes longer for the electrical signal to be completely distributed across both ventricles. The shape of the QRS complex reveals which bundle branch (right or left) is conducting the electrical impulse abnormally. In most cases, bundle branch block does not produce symptoms. However, in severe cases of bundle branch block (in particular, when both right and left bundle branches are significantly affected), the ability of the electrical impulse to reach both ventricles may become quite tenuous. In these cases, the electrical impulse may suddenly be prevented altogether from reaching the ventricles, leading to complete heart block — which can produce syncope or sudden cardiac death. In people with left bundle branch block who also have heart failure, the delay in contraction of the left ventricle produced by the bundle branch block can reduce the efficiency of the pumping ability of the heart, making the heart failure itself substantially worse. This means that doctors should specifically look for the presence of left bundle branch block in their patients with heart failure. However, bundle branch block also may be caused by underlying heart disease. In fact, left bundle branch block is almost always associated with a cardiac condition of some type. Whenever bundle branch block is identified, doctors should recommend a noninvasive cardiac evaluation with an echocardiogram to rule out these common underlying problems. Diagnosing bundle branch block is straightforward. A 12-lead ECG will show the characteristic widening of the QRS complex, along with the characteristic pattern of right or left bundle branch block (or, in some cases, an intraventricular condition delay that cannot be characterized as either right or left bundle branch block). Most of the time, bundle branch block itself does not require treatment. However, if it is being caused by underlying heart disease, that heart disease will need to be treated. It is not unusual for bundle branch block to be the first sign of heart disease, and to become the impetus for making a diagnosis. Occasionally, severe bundle branch block affecting both bundle branches may require the placement of a pacemaker to prevent episodes of complete heart block. In addition, people who have both significant heart failure and left bundle branch block (or, in some cases, an intraventricular conduction delay), can experience signifiant improvement in their symptoms of heart failure with a cardiac resynchronization therapy (CRT). CRT is a specialized pacemaker that re-coordinates the beating of the two ventricles, thus (in appropriately selected patients) greatly improving cardiac efficiency. Bundle branch block is a fairly common finding on the ECG. People who have bundle branch block should usually receive a noninvasive cardiac evaluation to look for underlying heart disease. While sometimes bundle branch block itself causes cardiac issues, in most cases it does not pose a significant problem.